A fascinating story broke on Friday written by my colleague Dave Berman at Florida Today Newspaper. Berman took a look at Canaveral Port Authority's embattled CEO John Walsh and his performance reviews from 2014 and 2015 and what appears to be a growing rift between Walsh and at least three commissioners who hammered him on his 2015 evaluation. Walsh's harshest critic was CPA Chairman Jerry Allender, which is surprising. Despite Allender, Com. Hank Evans and Com. Bruce Deardoff giving Walsh scathing reviews, Allender — at the very end of their Aug. 26 meeting and following public comment — brought forth a motion to raise Walsh's pay to $250,747 per year, a 5.4-percent raise. They also decided to extend Walsh's contract two years to 2018. Neither of the topics was on the agenda, and just prior to bringing up the subject Allender chastised Walsh and staff for not bringing agenda items to them in a timely manner. The vote was not unanimous, however. Just before Allender started discussing the compensation issue, Evans stood up and left the chamber. Walsh's compensation and contract passed 4-0 with commissioners Allender, Deardoff, Justice and Weinberg voting in favor of it. In the wake of denigrating comments directed at voters opposed to plans for a heavy cargo, diesel-powered rail extension — and unanomous opposition to the rail's planned routes from Brevard County Commissioners — Port Canaveral CEO John Walsh is getting all kinds of press. And it's not the kind you want when you are attempting to hew an 11-mile-long railway through a federally-managed manatee sanctuary and National Wildlife Refuge. 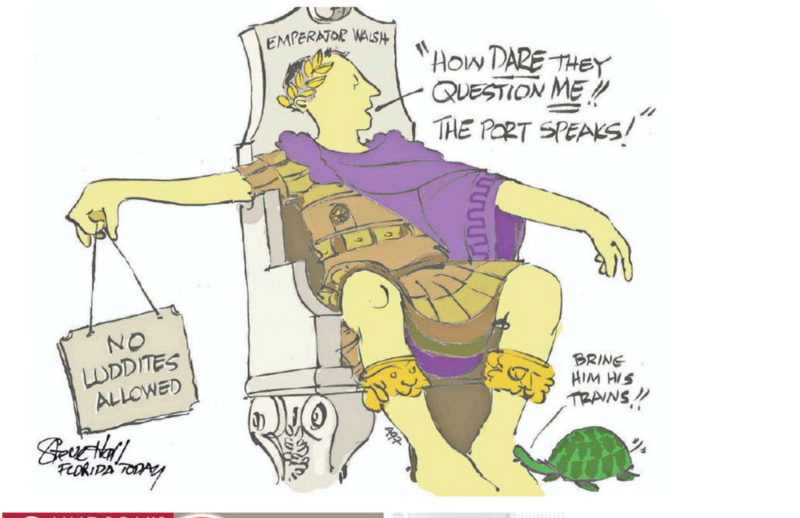 Port CEO John Walsh is The Orlando Sentinel's Chump of the Week for attacking opponents to his agency's beleaguered rail plan that many see as a threat to the Banana and Indian River lagoons and Merritt Island National Wildlife Refuge. One question remains: How long will Mr. Walsh have a job? Can anybody think of another public employee who openly lambasted voters and taxpayers, calling them "Luddites" and "dogs" — as captured on video — who still has their position? John Walsh makes disparaging remarks aimed at voters and taxpayers opposed to the CPA's controversial plan for a heavy cargo rail line through the Banana River and Merritt Island National Wildlife Refuge. Port Canaveral Executive Director and CEO John Walsh seems to be generating more questions than he is answers following his disparaging statements about taxpaying voters in the five Port districts in an August 26 public meeting of the CPA. I took the chance to pose a couple of questions from the excerpts of his talk about Luddites and the irony that they (we) have a website. CPA's John Walsh: Luddites Go Away! With overseas cargo numbers softening and increased opposition from other Florida seaports, the Canaveral Port Authority is feeling the sting as opposition grows for its embattled plan for an 11-mile-long heavy cargo railway that would hew its way through a National Wildlife Refuge, federally managed manatee sanctuary and hundreds of miles of endangered wetlands. But CPA executive director, John Walsh, has a message for taxpayers and voters opposed to his plan for environmental reasons: Luddites, Go Away! Really, I just don't know what to say. I am at a loss for words — and that is rare. So, I'll let John Walsh say it himself in his role as a public employee (executive director) of the Canaveral Port Authority at last week's board meeting. He was giving a presentation on the "feeling out in the community." Apparently, you are either with him or against him. If you aren't familiar with the term 'Luddite,' you can check it out here. Please also note that he didn't just say it, but he also wrote and published it in a PowerPoint slide. If, after the video, you have an opinion on the rail, either for or against, you'll find the email addresses for Mr. Walsh, the five port commissioners as well as all five Brevard County Commissioners, who will be considering a resolution Sept. 3 at 5 pm in Viera opposing a Merritt Island rail route. If you can figure out how to plug in the computer, drop them a line. I have to say, the folks at the Canaveral Port Authority have a rather rich sense of humor and peculiar knack for dealing with the voting and tax-paying public in a rather cheeky manner. Whether its one commissioner referring to folks that don't agree with them as "CAVE" people (Citizen's Against Virtually Everything), or hired help John Walsh attacking members of the mainstream and social media's journalistic credentials, they always seem to keep it light. But through all the mirth, they seem to have lost touch with the image above. It illustrates perfectly where the CPA's power emanates from; it's the largest grey shaded cell at the very top of the image. The one that represents the registered voters in the five port districts. So, without further adieu, here's Jerry Allender and his laugh parade during the opening of August 26th's public meeting of the CPA. He's really appreciative of community involvement — as long as you agree with whatever they want. After watching the video, make sure to let Comm. Allender know where you stand at jallender@portcanaveral.com. You can also let the other commissioners know as well: hevans@portcanaveral.com, tweinberg@portcanaveral.com, bdeardoff@portcanaveral.com, wjustice@portcanaveral.com. In the wake of revelations that the Canaveral Port Authority has hired an environmental hitman in the form of high-powered DC lawyer/lobbyist Kathryn Floyd in order to side-step government oversight and minimize citizen impact, the Canaveral Propeller Club is getting in the act, disparaging fellow Propeller Club member and District 2 County Commissioner Jim Barfield. In the email above, sent to Propeller Club members Monday afternoon, and obtained by tedlund.com, Dubea urged members to contact County Commissioners in an attempt to discredit Barfield and derail his resolution, scheduled for consideration in the County Commission Chambers in Viera, Thursday starting at 5 p.m. The email came from Propeller Club president Jim Dubea, but contained several attachments under official CPA cover. It included links to last Wednesday's Port Canaveral Rail Presentation by Floyd, a copy of Barfield's resolution and a sample letter for interested parties to cut, paste and forward to Commissioners. It was a clear attempt by the Propeller Club (and the CPA) to reign in County Commission and prevent them from taking any action that doesn't agree lock-step with the Canaveral Port Authority agenda. Jim Dubea, if you aren't aware, is the CPA's point person for its rail project as well as government relations. When not inciting Propeller Club members to turn on each other and disparage local elected officials, he's hard at work at his day job as Port Canaveral's deputy director for government and strategic partnerships. That's right: The CPA deputy director for government and strategic partnerships is openly attacking a sitting, elected official whose district encompasses Port Canaveral. Dubea was also at Kathryn Floyd's side during the CPA's Aug. 26th meeting after the professional environmental regulatory ninja conveniently showed up to give Port Commissioners a primer on the current status of the rail process so that the CPA could educate the County Commissioners. I believe our County Commissioners are smarter than that. Canaveral Port Authority chair, Titusville attorney Jerry Allender also chairs the Space Coast Transit Planning Organization. Last week, Canaveral Port Authority Chair Jerry Allender came out swinging at Brevard County Commissioner Jim Barfield after news broke that the District 2 Commissioner was putting forth a resolution opposing any Canaveral Rail Extension that traversed the Indian and Banana River lagoons as well as Merritt Island. Earlier this week, Allender penned the letter above to the County Commission, chiding them on the irresponsibility of acting on Barfield's resolution and even provided the commissioners with notes and a video link to a presentation from a "rail expert" who spoke at last week's CPA meeting. That was the very same meeting where Allender and other commissioners took a number of potshots at Barfield, Florida Today's Dave Berman and other members of the media and "people who really shouldn't be as interested in what the port is doing as they are." But as has come to be a hallmark of CPA leadership over the past 30 years, they didn't particularly come clean with all the details on their "rail expert," Kathryn Floyd. She's not an engineer. She doesn't build railroads. No. Instead, Floyd is a high-powered Washington attorney/lobbyist with the gold-plate DC firm, Venable LLP. In addition to having "extensive experience counseling companies regarding controversial hot-button projects that draw attention from regulatory agencies and outside groups threatening litigation or disruptions. Ms. Floyd consistently helps clients shape strategic responses and catalogue a documented record to minimize risk, advance approvals and, when necessary, beat back lawsuits. Many of these engagements arise when clients’ projects face opposition under environmental laws such as the National Environmental Policy Act, the Clean Water Act, the National Historic Preservation Act and the Endangered Species Act. In other words, Ms. Floyd is a hired gun who knows how to navigate the green tape, minimize public input in the process and get her clients the desired result — exclusive of environmental regulations or public wishes. 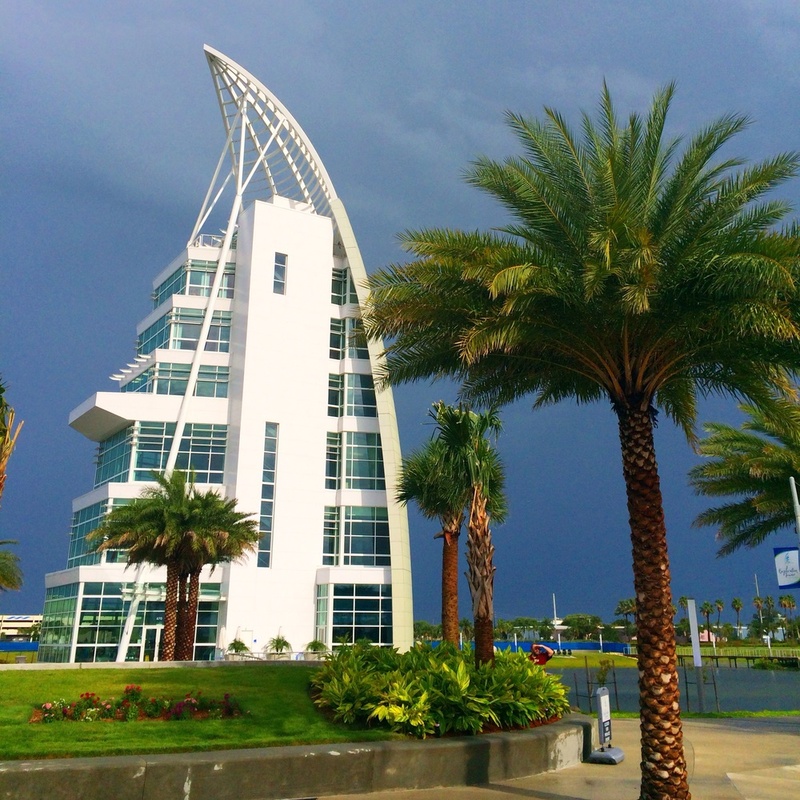 For the Canaveral Port Authority, it's a match made in heaven. And she doesn't just work with railroads. Ms. Floyd has a number of clients in the energy sector — mainly mining, drilling and fracking. That's your public money at work right there — paying Kathryn Floyd to work against you and your environment. For those that weren't able to attend, here's the complete Canaveral Port Authority Meeting. Pay special attention to all of the snide comments directed at the public, as well as Brevard County Commissioner Jim Barfield. What I see on display here is what has disenfranchised so many people with the American political system today; the attitude that you're either with us or against us. No middle ground, no compromise. Based on the way that I've been dealt with via email by the Executive Director, John Walsh and watching these comments and chuckles from the elected commissioners, it is clear that the disdain for the voting, tax-paying public runs deep. If you skip to the end at the public comments, you'll be able to watch oceanographer Mitch Roffer's impassioned plea for some sort of support from the commission to keep our NOAA weather buoys on line. I'll be posting an index of interesting things to view. Enjoy the Canaveral Port Authority in their own words. Yes, I know the photo on the opener of this post isn't Exploration Tower — it's ET's sister building, the Burj Khalifia in Dubai. But as the Canaveral Port Authority tries to figure out exactly what its identity and business model are, it would appear that building and operating world class attractions for a captive audience of cruise ship passengers isn't a part of it. Exploration Tower, the Port's homage to Dubai's Burj Al Khalifa, has posted an approximate $400k loss YTD for the first 10 months of the fiscal year, according to the port's Executive Director, John Walsh in this video clip from the Aug. 26th CPA commission meeting. The news isn't any better on the cargo front; true to last year's results, cargo has failed to live up to their expectations and projections. Now they're moving on to developing hotels, restaurants and possibly an aquarium. Comments from Port Canaveral ED John Walsh and Finance Director Rodger Rees. Buoy 410090 (the Canaveral 20-m buoy), one of two funded by NASA for the now defunct shuttle program, is scheduled to go offline next spring. Here's a piece I just wrote about Mitch Roffer (Roff's Ocean Forecasting) efforts to keep two critical weather buoys in operation off the east coast of Central Florida for Florida Today. I have to commend Mitch for his efforts, the Canaveral Port Commission for going against that stated wishes of embattled executive director John Walsh and to District 2 County Commissioner Jim Barfield for also taking up the cause. Barfield and the Port have recently been at odds, as Barfield is introducing a resolution to the commission that opposes the Canaveral Commercial Rail Extension — a plan that would hew a 17-mile-long heavy cargo railroad over and through a federal manatee sanctuary, national wildlife refuge and critically endangered marginal wetlands habitat. Public comment will be heard and the resolution voted on Thursday, September 3, 2015, 5 PM Building C, first floor, in the Commission Chambers at 2725 Judge Fran Jamieson Way, Viera. All interested parties (for or against) are encouraged to attend. Brevard County District 2 Commissioner Jim Barfield crafted the resolution with widespread support from varying stakeholder groups. As previously mentioned, Brevard County District 2 Commissioner Jim Barfield is presenting a resolution opposing the Canaveral Commercial Rail Extension at the commission's Sep. 3. meeting. We've obtained a copy of the resolution, which was written with the help of numerous stakeholders within Brevard County, including former Port Commissioner Sue Ford and NoFill NoKill founder, Alex Gorichky. The meeting will be held in the County Commission Chambers, Building C, First Floor, Viera Government Center beginning at 5 p.m. on Sep. 3. Opponents and supporters of the rail project will be given 5 minutes each to speak on the topic. For more information, visit Ford's website and online petition or NoFill NoKill on Facebook. My colleague Jim Waymer at Florida Today brings us the tale of Todd Jay Brown, and Kirk Damen Osborne who were both arrested and face third-degree felony charges for allegedly possessing an illegal gill net or entangling net. Brown was also cited for allegedly possessing an oversized red drum and a tarpon without a tarpon tag, both second-degree misdemeanors. Read his story here. This is just amazing. Alex "The Lionfish Killer" put this video together during the 2015 Jacksonville Lionfish Rodeo. In two dives his team killed 1,399 of the invasive species. That's a lot of good eats and a serious blow struck for the environment! My name is Ted Lund. I am an internationally-published writer, photographer and editor specializing in recreational angling, marine conservation and environmental issues. I was born and raised in Cocoa Beach, reside in District 2 and my career path has been directly influenced by the natural resources found along the Space Coast. I am writing on behalf of the Banana River Lagoon and North Merritt Island National Wildlife Refuge (NMINWR) — which have no voice. I ask that you support Comm. Barfield’s resolution opposing the Canaveral Port Authority’s plans to erect a commercial cargo railway through Merritt Island. The Banana River Lagoon — as part of the larger Indian River Lagoon complex — was designated an Estuary of National Significance under the National Estuary Program in 1987. A part of the NMINWR, this portion of the lagoon has been off-limits to mechanically-propelled vessels since 1991. This federally-managed refuge is home to the world’s largest concentration of endangered West Indian manatees as well as the largest breeding rookery of brown pelicans on the planet. In addition, it houses the last near-virgin stands of turtle and manatee grass left in the 156-mile-long IRL. More than 100,000 acres of seagrass have been lost lagoon-wide over the past decade; this area serves as a recharge zone for the rest of the lagoon thanks to conservation plans implemented in the 1950s with the arrival of NASA. The lagoon and surrounding environmentally sensitive wetlands are home to dozens of vulnerable, threatened and endangered species including gopher tortoise, indigo snakes, four different species of sea turtles, Florida scrub jays, wood storks, snail kites and the iconic symbol of our great nation, the bald eagle. In concert with the Indian River Lagoon, the Banana River Lagoon and NMINWR contribute nearly $750m in economic impact to our area via crucial jobs in the commercial and recreational fishing industries as well as through other tourism-related activities including paddleboarding, kayaking, windsurfing, birdwatching, ecotours and more. Your commission — in concert with regional, state and national lawmakers — is in the process of allocating nearly $10b to preserve and restore these fragile resources after more than a century of unbridled development and abuse. All of these things either mean something or they don’t. The Canaveral Port Authority’s plan to hew an 11-mile commercial cargo railway through the northern Banana River and environmentally sensitive wetlands on the margins of the Banana River Lagoon create a clear and present danger to a nationally-significant natural resource. In closing, I ask that you err on the side of the resource and support Comm. Barfield’s resolution. Greed and myopic vision have brought us to this point; your long-term vision and concern for our community, its residents and resources can help us steer clear. No projected economic impact warrants the long-term, environmental, quality-of-life and socio-economic devastation that this project would inflict on Brevard County and its residents. Alex Gorichky distributes signs for the April 30, 2015 informational meeting held by Port Canaveral. The standing-room-only event — with more than 300 attendees — was the only one held by the CPA, despite assurances by Executive Director John Walsh that meetings would be held "frequently" to keep the public informed on the Canaveral Rail Extension. Brevard's County Commission will consider a resolution opposing the Canaveral Port Authority's proposed cargo railway — that would hew its way through a Federally-managed sanctuary for the endangered West Indian manatee and the North Merritt Island National Wildlife Refuge — during its Sept. 3 meeting starting at 5 p.m. at the Viera Government Center. Here's a sneak peak at the subject of my outdoor column this week in Florida Today's Sports section. It should be up later this afternoon. Had the chance to get out Friday with Capt. Jim Ross aboard the 24-foot Skeeter, Fine Line and shoot some pictures of a new artificial reef being built. The Florida Sport Fishing Association and Brevard County (in conjunction with the Central Florida Offshore Anglers) deployed 24 manmade artificial reef modules about 15 miles due east of Port Canaveral, Florida. A good starting point for the new reef is 28 24 .0852 N / 080 18 .4604 W. This is roughly 1/2 mile west of the area known locally as the Lumps and in the northwest corner of the existing artificial reef area permitted to Brevard County and the FSFA. Specific numbers will be available on the FSFA and CFOA websites for members.